“This is George. 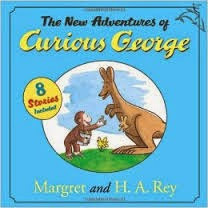 George was a good little monkey and always very curious.” This is the opening line for every Curious George book ever written. George is a very curious, affectionate, and energetic monkey whose intentions are always good. However, sometimes when he “sees something to climb, he can’t help himself. He has to climb it.” Does this sound like your child? 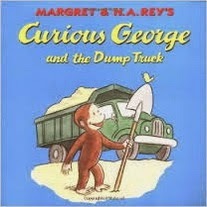 The Curious George books perfectly capture the natural, positive curiosity of childhood. With his guardian/parent, “The Man in the Yellow Hat,” always by his side, George learns about life through new experiences, adventures, and many, many mishaps. When he learns to ride a bike and make pancakes, he does so with the adorable messiness of a rambunctious, curious child. He is, in Israeli terms, שובב (“playfully mischievous” with a positive connotation - see explanation below). The original books were written and illustrated by Margret and H.A. 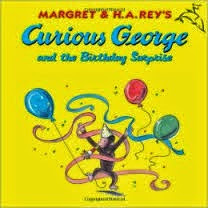 Rey (מרגרט וה"א ריי) who, on the eve of the Nazi invasion, fled Paris on bicycles with the original Curious George manuscript. Today, there are a number of newer books authored by others based upon the original characters. These new books are just as good as the originals. Two of the anthologies of the newer stories are also available in Hebrew. 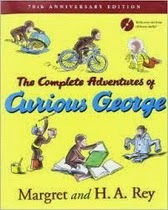 In this anthology of the new stories, George jumps into exploring life in a way only a curious monkey – or child – can. He makes a mess in the kitchen trying to frost a cake, rearranges the books in a library, accidentally operates a dump truck, and delights in riding for the first time the subway in New York City. It is a wonderful collection filled with fun and adventure. Both the English and Hebrew versions are available in the major bookstores in Israel and online. 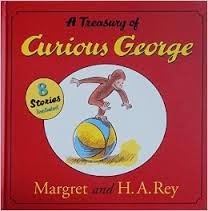 In this follow-up anthology to “A Treasury of Curious George,” George “helps” out in a chocolate factory à la Lucille Ball, locates a lost puppy, makes pancakes at a fair, visits the zoo, goes to a movie, rides a hot air balloon, learns to ski, and dreams about life being as big as King Kong. My son can recite the hot air balloon story verbatim. This anthology never fails to delight. Both the English and Hebrew versions are available in the major bookstores in Israel and online. This anthology features the original seven stories written by Margret and H.A. Rey, in which George learns to ride a bike, fly a kite, fish, and explore his new life in America. Unlike the newer stories, the original seven contain themes and events that require explanation from parents and are more appropriate for older children. For example, these stories tell how George was snatched from Africa and taken to America. While I found this anthology in Tzomet Sfarim in Tel Aviv, it does not appear to be widely available in Israel. It can be ordered online. 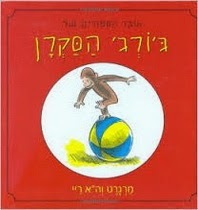 In addition to the anthologies, many of the individual Curious George books are widely available in Israel. The individual books are only available in English, although many of the stories are available in Hebrew in the anthologies. 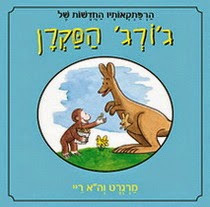 Every bookstore in Israel seems to have English language copies of “Curious George and the Birthday Surprise,” “Curious George and the Dump Truck,” and “Curious George Takes a Train,” (which are all also featured in the Hebrew version of the anthology, “A Treasury of Curious George”). This story is one of the original ones by Margret and H.A. Rey. 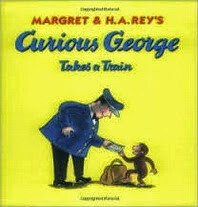 It is featured in “The Complete Adventures of Curious George” and is also available as a stand-alone. 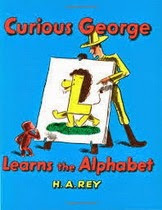 In this book, the Man in the Yellow Hat teaches George the uppercase and lowercase letters of the English alphabet. The illustrations are adorable and, as always, George makes a mess. I ordered this book online. While this is a blog about books, I cannot help myself in recommending the English language Curious George animated television series that is currently broadcast on PBS in the United States and available on DVD. The cartoons, which illustrate and explain concepts in math and science, are funny, adorable, smart, and well-written. Israelis value children who are שובב (pronounced “shovav”). Shovav is “mischievous” with a positive connotation. A shovav child is one filled with curiosity and playfulness who cannot help himself if he sees something to climb: he has to climb it to learn what is up at the top, even if he does not mean to upset his parents, make a mess, or otherwise cause בלגן (pronounced “balagan”…ah…another great word in modern Hebrew…). My son adores George precisely because he is shovav just like him. Books reading is a very good habit, it has many habits, reading helps us to recrudesce stress,professional dissertation writers post reading increases the knowledge of readers, reading can make us a better person, reading can help us to sleep better, reading improves the concentration of students.